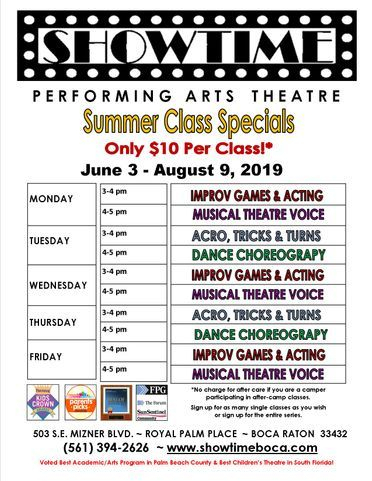 10 weeks of Performances and 100 after-camp class specials! 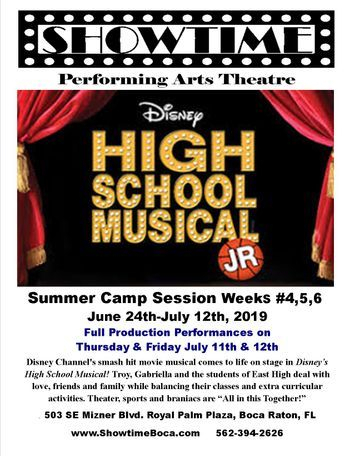 one 3 week fully-staged Musical Production Camp, HIGH SCHOOL MUSICAL! Register for multiple weeks, receive multiple discounts! 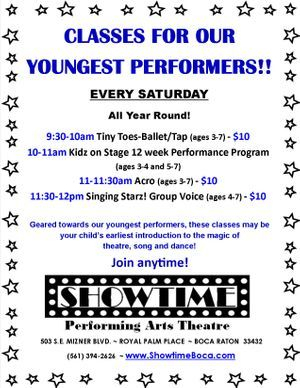 1 Week Musical Theatre Mini-Camps! CLICK HERE to Register for Summer After-Camp Classes! 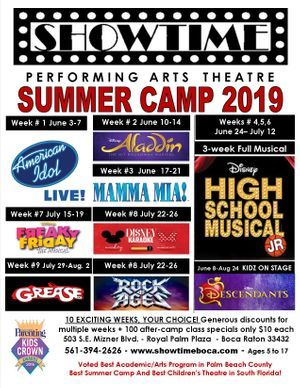 Campers, working in groups ages 5 and up, will enjoy learning choreography, vocals, acting and scene work from these Broadway and Musical hits! Grouped by age, experience and ability and guided by our talented and professional staff of Acting Directors, Music Directors, Voice Coaches and Choreographers, campers will present on Fridays a performance on the SHOWTIME Stage! Week #1: American Idol LIVE! 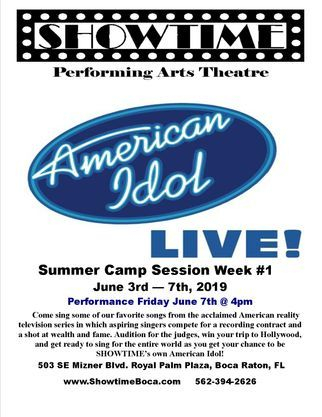 : June 3rd-7th Come sing some of your favorite songs from the popular American reality television series in which aspiring singers compete for a recording contract and a shot at wealth and fame. Audition for the judges, win your trip to Hollywood, sing for the entire world and your chance to be SHOWTIME’s own American Idol! Week #2: Aladdin Anniversary Edition! : June 10th-14th Celebrate Aladdin’s 5th year on Broadway and new live action movie remake with the best songs from this classic musical. Based on the 1992 animated film, a street-smart commoner’s whole life changes when he meets a magical genie who can grant him three wishes. Campers will enjoy singing, dancing, acting & performing songs and choreography from this very popular musical. Week #3: Mamma Mia - Here We Go Again! 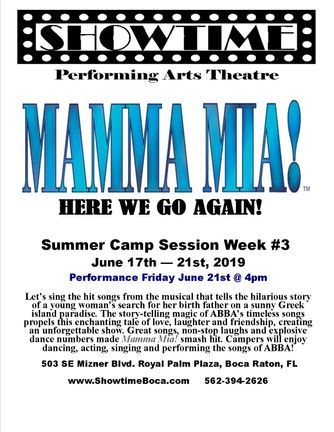 : June 17th-21st Let’s sing the hit songs from the musical that tells the hilarious story of a young woman's search for her birth father on a sunny Greek island paradise. The story-telling magic of ABBA's timeless songs propels this enchanting tale of love, laughter and friendship, creating an unforgettable show. Great songs, non-stop laughs and explosive dance numbers made Mamma Mia! smash hit. Campers will enjoy dancing, acting, singing and performing the songs of ABBA! Disney Channel's smash hit movie musical comes to life on stage in Disney's High School Musical! Troy, Gabriella and the students of East High deal with love, friends and family while balancing their classes and extra curicular activities. Theater, sports and braniacs are "All in this Together!". The full musical will be performed on the last 2 days of camp! Week #7: Freaky Friday: July 15th-19th Featuring the best songs from Disney’s new hit musical about an overworked mother and her teenage daughter magically swapping bodies and having just one day to put things right again. Freaky Friday is a heartfelt comedy and unexpectedly emotional update on an American classic. By spending a day in each other's shoes, Katherine and Ellie come to appreciate one another's struggles, learn self-acceptance, and realize the immeasurable love and mutual respect that bond a mother and daughter. Campers will enjoy dancing, acting, singing and performing. Disney fans will shine like the characters they love as we choose our favorite hits from beloved Disney classics that made their way to the Great Broadway! 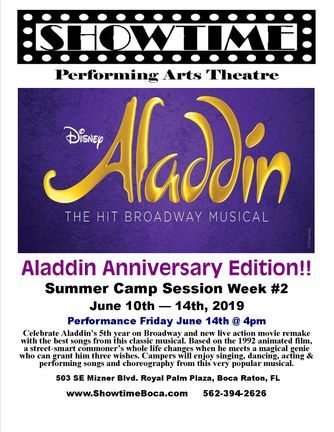 Campers will enjoy singing, dancing, acting, and performing favorite songs from Disney’s Broadway shows! Week #9: GREASE! : July 29th-August 2nd Travel back in time to our favorite 50’s musical about Danny Zuko and Sandy Olsson’s summer love and how they overcome teenage life now that they both attend Rydell High. With such classics as “Grease Lightning”, “Summer Loving” and “We Go Together”, it’s time to sing and dance with our favorite Pink Ladies and T-Birds! Campers will enjoy singing, dancing, acting, and performing favorite songs from GREASE. Week #10: ROCK OF AGES: August 5th-9th A jukebox musical built around classic rock songs from the 1980s, ROCK OF AGES hits home with the bands of that decade. The musical features songs from Styx, Journey, Bon Jovi, Pat Benatar, Twisted Sister, Steve Perry, Poison and Europe, among other well-known rock bands, that takes you back to the times of big bands with big egos playing big guitar solos and sporting even bigger hair! Campers will enjoy dancing, acting, singing and performing the songs of ABBA! 1. Dance shoes & attire. We will be dancing every day. Campers must bring their jazz shoes (black jazz slip-ons) each day for dance rehearsals, classes and for the performances. No Crocs, sandals or Flip-Flops please! We do have these shoes available for sale at the studio. Just let us know your street shoe size! Please dress in comfortable clothes that do not restrict movement. Campers should arrive each day with hair pulled back with an elastic hair tie, off the face. 2. Lunch. Please pack a lunch for your camper each day. Every Friday we do offer an optional Pizza Lunch Buffet which includes pizza, salad, fruit, desserts and beverages. The cost is $8. Please let us know if you would like to order the buffet, otherwise please pack lunch. 3. Snacks. We do offer a wide assortment of snacks and beverages for purchase for $1 each. You can send snacks or money with your child each day or open a “Snack Account” from which we will deduct $1 for each snack or beverage purchased by your camper. It is recommended that you prepay for use of this service if you know that you will be utilizing it for the session or for certain days. a. Morning Camp: If you have not prepaid for morning camp, your camper should be dropped off at 9am. Should you need to bring your camper anytime before 9am, please contact our office to make those arrangements. A $10 charge will apply for drop off between 8 and 9am. b. After Camp: If you have not prepaid for after-camp, your camper should be picked up at 3pm. After-camp charges are $5 per hour until 6pm. You only need to pay for the hours that you use. Between 3-4pm - $5, 4-5pm - $5, 5-6pm - $5. 5. IMPORTANT: For the safety of each student! Morning procedure: Each camper MUST be walked in and signed in by an adult. Afternoon procedure: Each camper MUST be signed out by an adult to be released. 6. Please contact us with any questions or special needs. We look forward to a great camp experience!